Frederick Oatley was born in Sydney in 1818, the third son of convict James Oatley and his wife Mary. James, a watchmaker of Stafford, had been convicted at the Southampton Assizes in 1814, and arrived in Sydney on the transport Marquis of Wellington on 27.1.1815. His wife, travelling as a free settler on the Northampton, arrived on 18.6.1815 with their firstborn, Frederick’s older brother Robert, born on the voyage. Despite this unpromising episode in his life, James Oatley went on to make his way in the colony of New South Wales and to establish a sound basis for his children to build upon, his status as an early landholder of some substance reflected in the fact that the Sydney suburb of Oatley is named for him. In this regard, James Oatley was fortunate that the initial years of his sentence corresponded with the term of the colony’s fifth Governor, Lachlan Macquarie, whose philosophy was to encourage the emancipist and facilitate his transformation into a stable, worthwhile member of the settlement. Carrying on his former trade of watch-making, James set himself up in George Street in the business into which Frederick would initially follow him, and was appointed by Lachlan Macquarie as the Keeper of the Town Clock. He was later commissioned by the governor to create the clock for the pediment of the new barracks in Macquarie Street, surviving today as the Hyde Park Barracks and completed in 1818. Oatley was paid £75 for this work in June 1819. James was conditionally pardoned in 1821 and went on to amass a considerable acreage in the Hurstville district. He was buried in a family vault on his farm Snugsburough, near modern day Punchbowl, where he died, aged 70 in 1839. Frederick Oatley was twenty years old when his father died in 1839, and he took over the running of the George Street business. Two years later, on 18 February 1841, he married Jane Weedon, at Christ Church St Lawrence in the city. The couple had a large family; at least seven children, born between 1844 and 1862, are recorded on indexes to NSW Births, but other known offspring would seem to have escaped the centralized baptismal records and the records of civil registration. In an era of high infant mortality, Frederick and Jane experienced the typical losses of parents of their day. At least one child, Herbert, died in infancy, and the family suffered a great tragedy on 28 November 1868 when Frederick and Jane’s young adult sons, Alfred and James, were drowned while fishing off Point Piper in Rose Bay. The two were aged 19 and 21 respectively. Frederick appears to have either abandoned or augmented watch-making as an occupation after some time in the trade, working as an inspector for the City administration by the time he was elected as a councillor of Woollahra. The timing of this transition is difficult to pinpoint; Oatley’s name is listed in a city directory in 1844 as a watchmaker at 332 George Street, while a similar publication records him as the Inspector of slaughterhouses, based in Strawberry Hills (present day Surrey Hills). In October 1860, Oatley tendered his resignation to the City Council as the Inspector of Slaughterhouses under the corporation, on account of the closing of the city slaughterhouse consequent upon the opening of the Glebe Island abattoir. However, by 1861 Oatley appears to have been appointed the Inspector of the Glebe Island facility, according to a letter published in the Herald defending the conduct of its workers. The letter is signed Frederick Oatley, Inspector of Glebe Island. Service as a member of the first Woollahra Council added to Frederick’s other roles in public and community life. He was a parishioner at St Matthias’s Paddington, where he served for many years as a warden, and he was named in August 1874 as a trustee for land at Paddington dedicated for a Church of England School. Frederick was not the only descendent of his convict father to contribute and engage in public life. His older brother James, the licensee of the Sportsman’s Arms hotel on the corner of Pitt and Goulburn Streets, served on the City Council, elected as mayor of the corporation in 1862. James also represented the people of Canterbury in the Legislative Assembly between 1864 and 1869. Footprint of Sandy Knowe, municipal map of Woollahra, 1890. The Oatley family appears to have settled in Woollahra at some time between September 1857, when a Herald birth notice announced that a daughter had been born to Frederick and Jane Oatley at the family home in Bourke Street Surrey Hills, and October 1859, when Frederick’s name is listed on the 1859 petition to form the Municipality of Woollahra, against an address of Ocean Street. This is almost certainly a reference to his house Sandy Knowe, located on the corner of Ocean and Trelawney Streets in the suburb of Woollahra, where Oatley lived until his death in 1890. Oatley’s Sandy Knowe stood on part of an area of land leased from the Cooper estate in 1856 by fellow 1860s councillor Gerard Phillips, a three acre parcel bound by Ocean, Trelawney and Fullerton Streets – the latter known as Oatley Street until re-named in 1886 for Dr Fullerton’s adjoining 12-acre holding. 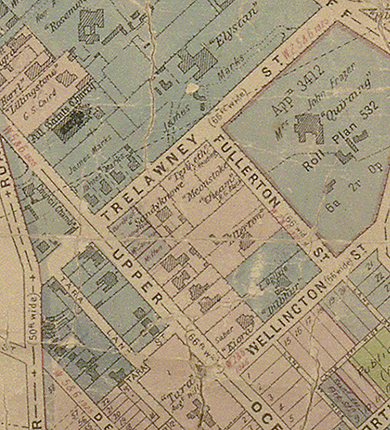 The footprint of Sandy Knowe on the 1887 plan suggests a substantial dwelling situated on a parcel of land approximated in today’s terms by 12 and 12A Trelawney Street. The esteem with which the Oatley family was held in Woollahra was evidenced in the reaction of the community to the news of the untimely deaths of Alfred and James in 1868. The loss was reported to have ‘cast a gloom over the neighbourhood where their parents lived’. Frederick Oatley showed his early commitment to local government in this area by signing, in October 1859, the petition to the colonial government supporting the formation of the municipality of Woollahra. He was by far the most popular prospective candidate proposed for election at a public meeting of the district’s electors held at the Victoria Inn 9 May 1860, and went on to receive the highest number of votes – 88 – at the official ballot held on the 28 May. Frederick Oatley served as a councillor for over 24 years, from his initial election in May 1860 until the annual election held in February 1884. While never elected to the chair, Oatley nevertheless served as the elected treasurer of council for a total of seven years. This granted him ex officio membership of council’s Finance committee, and he served also on the Improvements committee in 1873. In 1861, as council set out to establish a purpose-built council chambers, Oatley was appointed to the committee charged with investigating the various possibilities. The new council headquarters was eventually established on a a large site bound by the junction of Ocean Street and Jersey Road. Oatley’s wife Jane died at Sandy Knowe on 6th March 1884 – possibly the reason for Frederick’s retirement from council a month before. Frederick Oatley remained a resident of Woollahra following her death, but died at the Petersham home of his son-in-law, C B Broughton, on 30 May 1890. Frederick and Jane Oatley are buried in the Anglican section of Waverley cemetery, with a large number of their descendents. Oatley, James (1770 - 1839), Australian Dictionary of Biography, Volume 2, Melb. Uni. Press, 1967, pp 291-292.